Dr. Maryellen DeBanff is committed to providing a positive dental experience by delivering results that are natural looking and beautiful while making your comfort a priority. After a thorough assessment and carefully listening to your concerns, our cosmetic dentist will recommend the most appropriate treatment to help you reach your specific goals. 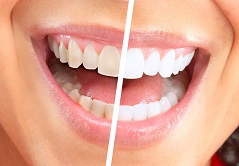 Whether you are seeking a simple cosmetic dental treatment such as teeth whitening or veneers in Yucaipa, or need a restorative procedure to place a crown or bridge, Dr. DeBanff has the skill and experience to ensure that the look and feel of your treated teeth blend in seamlessly for a uniformly beautiful and comfortable smile. Composite Fillings – Teeth affected by decay can be restored with tooth-colored composite material so that your dental work doesn’t stand out in your smile. Teeth whitening – Teeth that have become stained due to improper home oral hygiene, tobacco use, or the consumption of richly-pigmented food and drinks like wine, coffee, and tea can benefit from this simple and effective treatment that can make your smile many shades brighter. Veneers – Teeth that are chipped, have minor gaps, are mildly misaligned or permanently discolored can be made to look beautiful and healthy with these thin, shells that are affixed to the fronts of damaged teeth to completely transform your smile in as little as two office visits. Porcelain Crowns – A tooth that has been cracked or broken by an injury, or has developed a cavity that is too large to be restored with a simple filling, is best repaired with a dental crown (or cap) which is placed over the entire visible surface of the tooth, protecting it and concealing imperfections. Fixed Bridges – A missing tooth leaves a gap in your smile that can cause other teeth out of alignment and reduce your ability to chew properly. A fixed bridge is a permanent solution for a missing tooth that uses crowns over the two healthy adjacent teeth to attach and anchor the replacement tooth (pontic) providing strength and durability. Dr. DeBanff customizes her cosmetic dental services in Yucaipa to provide full smile-makeovers. By combining any of our cosmetic dental services, she is able to completely revitalize the appearance of your smile. Our services can treat serious issues like decay and missing teeth with crowns and bridges while brightening and perfecting the appearance of enamel with whitening or veneers. The finished result is a smile that both looks and feels healthy while remaining balanced and bright. Our dentist is careful to avoid over-treatment and recommends procedures that will preserve your healthy teeth while helping you meet your specific cosmetic dental needs. Whatever your smile goals are, Yucaipa cosmetic dentist Dr. DeBanff and the team at Dentartistry is happy to help you achieve a healthy, confident, and attractive smile. Call us at 909.797.1077 to learn more!